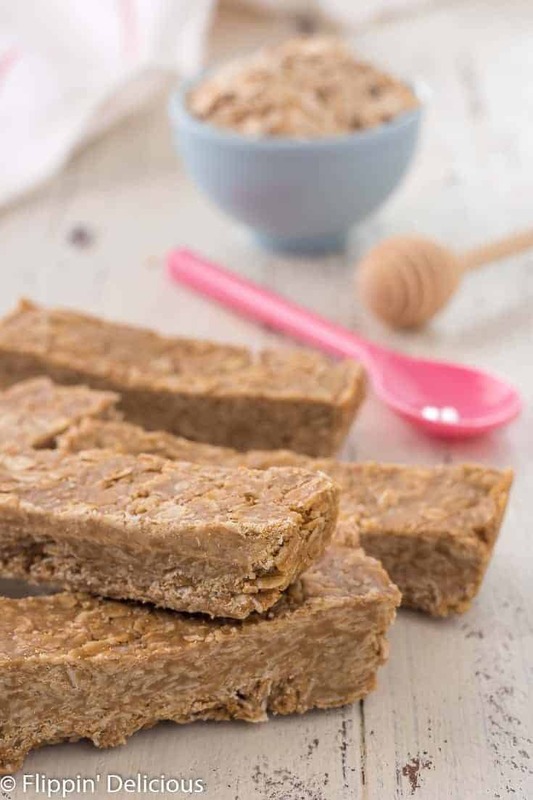 Gluten Free SunButter Honey Granola Bars are ready, start to finish, in less than 15 minutes! With just 3 ingredients, this recipe couldn’t be easier or more allergy friendly. This post is sponsored by SunButter. I love SunButter and use it often in our home, which is why I’m honored to partner with them and help raise awareness about allergies. As always, all opinions are entirely my own. Thanks for supporting the companies Flippin’ Delicious™ loves and works with. May is one of my favorite months as a blogger because it is both Allergy Awareness Month and Celiac Disease Awareness Month. 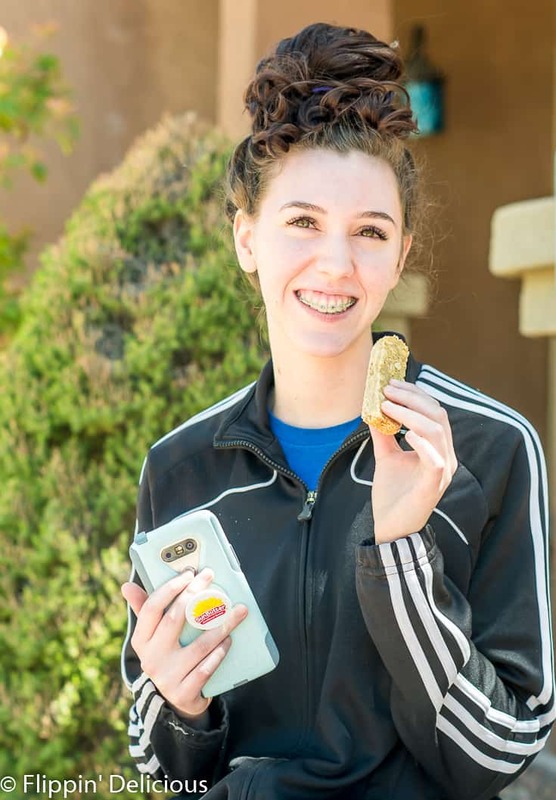 One of my missions as a blogger is to raise awareness about allergies and celiac all year round, which just makes the month of May very special. Today I’m excited to highlight one of my favorite allergy-friendly and gluten-free products, SunButter. This recipe comes together quickly and has just 3 ingredients. 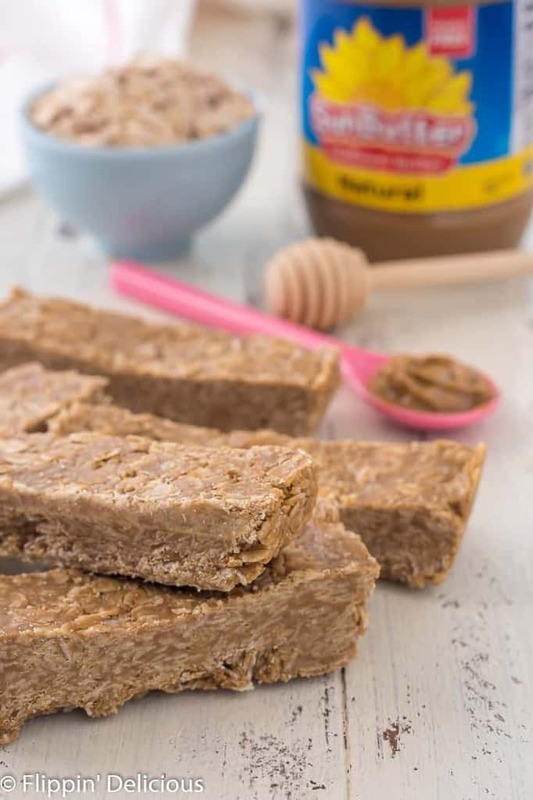 All you need is honey, SunButter, and gluten-free oats. I use purity protocol gluten-free oats. This time I decided to lightly toast my oats in the oven, but if you are in a rush you can skip it. First, melt the honey and let it boil for one minute. Stir in your SunButter, then mix in your oats and press the mixture into a loaf pan. Once they cool, slice them into portable bars. I used Natural SunButter for the recipe because with the honey, it is plenty sweet! From start to finish, I made these granola bars in 15 minutes. They are the perfect allergy-friendly snack to tuck into a lunchbox or bring to the park. Why should you switch to SunButter? Now, let me tell you why SunButter is a staple in my pantry. I have a sister with an anaphylactic peanut allergy. She is 19 now. Her allergy has affected our whole family as we’ve all taken precautions to keep her safe. Even now, living in my own home with my own family, I still take great care to limit the peanuts in my house. Especially after my sister visited one day after I made gluten free peanut butter bars. I was horrified! She was fine, but my own carelessness upset me and shortly after that my family switched to SunButter. 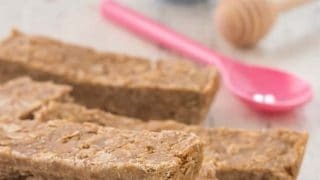 (I’ve since converted my peanut butter bar recipe to this Gluten Free Lunch Lady SunButter Bar recipe). With my sister’s peanut allergy, my dad’s tree nut allergy, and our family history of celiac disease, we’ve made many allergy adaptions over the years. We throw a pretty fabulous allergy-friendly party; you should see all the pies we made at Thanksgiving! How can you raise allergy awareness? 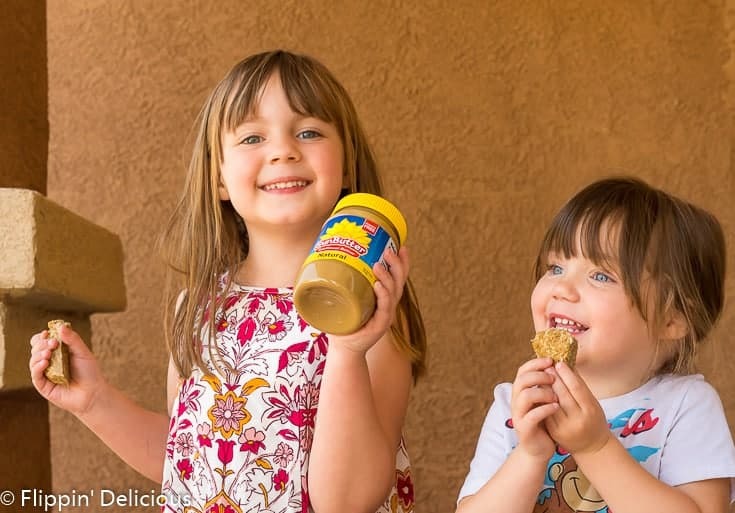 Making simple swaps in our pantries, like using SunButter instead of peanut or other nut butters, can help to keep other people in our families, schools, and communities safe from allergic reactions. I love that SunButter is widely available, is certified gluten-free (so I know it is safe for me too) and it has a great taste! If you need help finding SunButter near you, you can use this product locator. My family always has a jar of the creamy or crunchy on hand for making SunButter Blossoms or sandwiches (like my gluten free peanut free fluffernutter sandwiches). 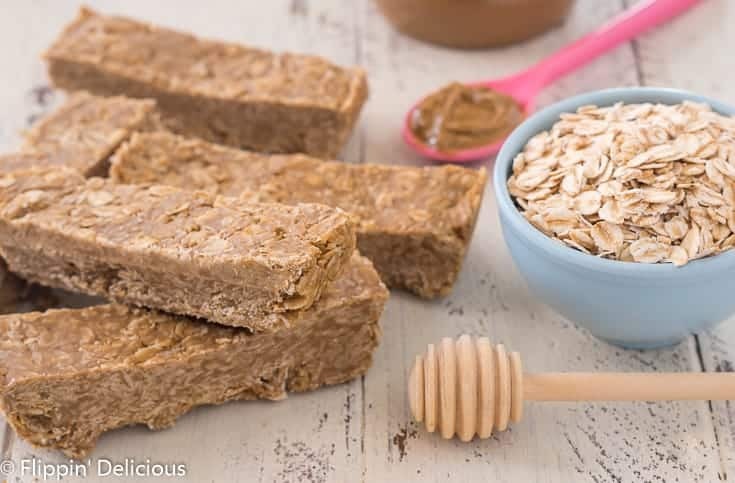 I like to keep a jar of Natural or Organic SunButter in my pantry for adding to peanut-free pad Thai or making these quick and easy SunButter Honey Granola Bars. 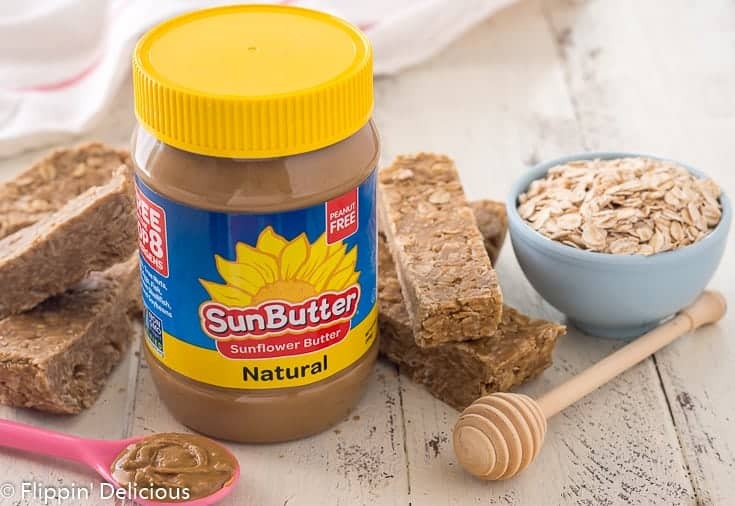 Let’s Make Some No-Bake SunButter Honey Granola Bars! If desired, toast your oats by baking them in a 350°f oven for 10 minutes, stirring occasionally. Line a regular loaf pan with parchment paper, wax paper, plastic wrap, or aluminum foil (to make it easier to remove the SunButter Granola Bars). In a small saucepan, heat the honey until is starts to bubble. Let it boil for 60 seconds. Remove from heat and stir in the SunButter. Quickly add the gluten free oats and mix until evenly combined. Press into the prepared loaf pan and cool. Cut into bars and store in an airtight container for up to 2 weeks (up to 2 months in the freezer). Love that you shared your sister’s story and you’re taking a huge step to be supportive. A bit more expensive, but safer and INCREDIBLY delicious! My husband’s school is a nut-free zone and I use SunButter in his lunches, and sunflower seeds instead of nuts in his trail mix. So easy and above all – so thoughtful! Great job! Thank you Jules! It really is so easy, and anyone can make the switch.